Here is one we are sponsoring for you. We are going to give one Petacular Reader a $5 GC to Coldstone and a $5 GC to Petco. That way, both you and your pet can have a treat on us. this is being sponsored by Lori - At the Fence, Hope - Hope's Cafe, and Modesty - PI of Products. It is our way of saying thank you to you our readers for your continued support of our sites. I didn't like that I didn't win ANY of the giveaways! But seriously, I thought it was great to have such a concentration of pet-themed giveaways at once, get that target audience in and keep them reading! I really enjoyed hearing about new products that my dog might enjoy. This was great! Thanks! 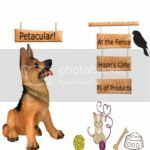 Petacular was great for those who have pets. You had a great variety of very nice products with reviews and giveaways. However not everyone has pets. I'd like to see other giveaways (that are not pet-related) running at the same time as your next Petacular. I loved having a whole series of giveaways that just focused on on our fur babies! They are such a part of our family and though I didn't win anything (as far as I know since I don't think all the winners have been chosen) I've had fun and hope to see more like this! I liked the great prizes you offered, but was frustrated that I never saw winners announced, even after the giveaways ended. With as many giveaways as there were, and with the number of entries I had in each, I had really hoped I would win something. I'm very disappointed that I haven't. I have 3 dogs so I loved the event. You had some really great and new products featured. Hope I win something!